The U.S. Senate Tuesday afternoon passed a federal Farm Bill, 68-32. The bill now heads to President Obama, who is expected to sign it. The Detroit Free Press reported Obama could sign the bill on Friday, Feb. 7, during a visit to Michigan State University. Michigan is the home state of Sen. Debbie Stabenow, chair of the Senate Ag Committee. Senate Democrats overwhelmingly approved the bill, 44-9. However, Republicans were almost evenly split, 22 for and 23 against. Among the 23 "major dairy states," 34 of 46 senators voted to approve the measure. To see how you senator voted, click here. Jim Mulhern, president and CEO of the National Milk Producers Federation (NMPF), noted the battle of the Farm Bill, and especially the dairy title, has been long. "It has been a long and torturous road toward the creation of a better safety net for dairy farmers, but with today's vote in the Senate to approve the farm bill, coupled with last week's House vote, that five-year journey has reached its end," Mulhern said. "We didn't wind up precisely where we wanted in terms of the dairy program, but the milk glass is more than half-full," he continued. 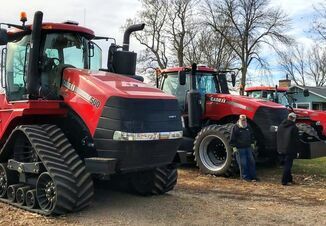 "The new farm bill replaces three outmoded programs intended to help farmers – but that often failed in that effort. In their place is a new, more modern, and more comprehensive margin protection program offering dairy producers a far better and more effective safety net. Because it is designed to protect against periods of both low milk prices as well as high feed costs, margin insurance is a better risk management tool to help farmers deal with the global volatility in commodity prices in the 21st century. Mulhern thanked Sens. Debbie Stabenow, Thad Cochran and Patrick Leahy, and Reps. Frank Lucas and Collin Peterson, for their efforts to fashion this new dairy policy. "I also want to express my appreciation to all of the farmers, cooperatives, and farm organizations that have helped throughout this long process," Mulhern said. "The members of NMPF have worked tirelessly since 2009 to build a new and better dairy program. The farm bill's margin protection program is a tribute to their dedication and commitment." U.S. dairy producers won't likely feel the impact of the Farm Bill – at least on dairy policy – until later this fall. Under the bill, USDA must establish a Margin Protection Program for dairy producers no later than Sept. 1, 2014. The Dairy Title of the Agricultural Act of 2014 was outlined previously by Dairy Herd Management. Also, several leading dairy economists have compiled a podcast and two papers (Dairy Subtitle of the Agricultural Act of 2014 Information Letter 14-01 and Price Discovery, Volatility Spillovers and Adequacy of Speculation in the U.S. Dairy Markets) covering provisions contained in the dairy title. The resources and more information are available on the University of Wisconsin-Madison Program on Dairy Markets and Policy website: http://dairy.wisc.edu/. Other notables commenting on passage of the Farm Bill follow. Today's action will allow the proud men and women who feed millions around the world to invest confidently in the future. Our communities will have additional support to attract new economic opportunity and create jobs. During difficult times, children, working families, seniors and people with disabilities will have access to nutritious food. The potential of new products, treatments and discoveries will be strengthened through new agricultural research. Renewed conservation efforts will protect our fields, forests and waters creating new tourism options. This legislation is important to the entire nation. I am pleased the Senate passed the conference report and put us another step closer to enacting a new farm bill. I commend Chairwoman Stabenow and Ranking Member Cochran on their efforts throughout this process. We worked together to give certainty and sound policy to our agricultural producers; deliver taxpayers billions of dollars in savings; and provide consumers the affordable and reliable food supply they have grown accustomed to." The American Farm Bureau Federation commends the Senate for passing the new five-year farm bill with clear, bipartisan support. America's farmers and ranchers are one step closer to having the certainty needed—and provided by the farm bill—to make planting and farm business decisions. The farm bill provides farmers and ranchers certainty for the coming year, allowing them to continue with their business of providing food and jobs for America. We are particularly pleased with provisions in the 2014 farm bill to provide risk management to fruit and vegetable farmers and to support livestock farmers during disasters. We are pleased that the organic industry received strong support in the Farm Bill that cleared the Senate today. More and more, consumers and farmers alike are choosing organic. Giving them that choice is important. The Senate has demonstrated strong support for diversity in agriculture—recognizing that organic production plays a vital role in offering production options to U.S. farmers, food choices for American families, and strengthening our country's economy. The Farm Bill that has now gained approval in both houses of Congress demonstrates that the consumer-driven, farmer-powered organic sector—the fourth-largest food and feed commodity—is an important part of the U.S. agricultural community. It is a victory for organic farmers, businesses and consumers. We now look forward to quick action by President Obama to sign this legislation into law.